Jive Media Africa has produced a number of products demystifying tricky health issues such as TB treatment, Genetic Conditions as well as dealing with disabilities. 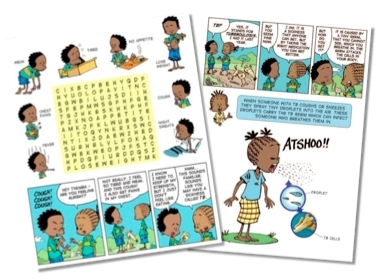 A TB adherence initiative for children using comics and activities to reinforce key messages. A simple narrative of a child who is helped to recover from TB with the support of another child who has overcome the disease. Through the narrative, activities and inputs are presented to assist in the communication of the key concepts and messages.